The damaged sportsfields at Tynwald Park. SENSELESS damage was done to the Tynwald Park soccer fields and football grounds last night. Derwent Valley mayor Martyn Evans said he was certain all New Norfolk residents would share his sense of outrage. 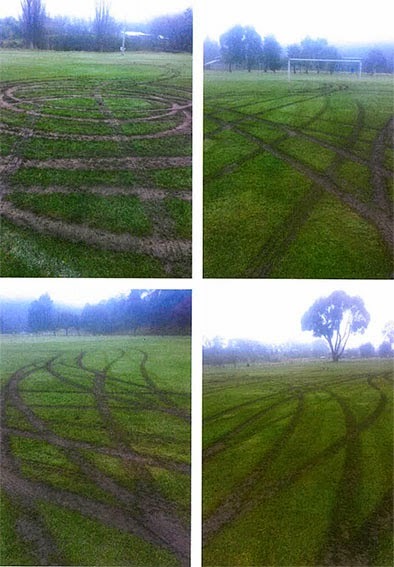 Cr Evans said the playing fields had been torn up by one or more cars late last night and he wanted the culprits to be held to account. He said six council staff had spent many hours repairing the damage today. Rostered matches should still be able to go ahead this weekend, but it was likely that training would be disrupted during the week. Cr Evans has urged anyone with information about the incident to contact himself, local police, or CrimeStoppers. The number for CrimeStoppers is 1800 333 000.